MILI LO is a boutique event design and planning company based in Athens, Greece. We create memorable life experiences that combine your unique character and style with our expertise in creative décor and event planning services. Our style is warm, sophisticated, authentic, and refined, and our team is made up of highly professional and experienced individuals who perfectly curate weddings in Greece, traditional baptisms, corporate events and social soirees. From big picture aesthetics to intricate logistical details, our expert team seamlessly brings all of the necessary details together, handling everything from start to finish. It is our goal for you to feel comfortable and supported throughout the entire planning process and above all, we want you to enjoy every moment and feel exceptionally happy on the day of your special event in Greece. As a founder and event curator of this boutique company, Emily wanted a personal approach, something catchy and with a good ring to it, so she simply went for MILI LO after her name Emily Logothetis. From a very young age, Emily was easily inspired; her imagination would trigger and her creativity would run wild. She inherited her artistic talent and resourcefulness in the creative environment she grew up in, in Athens Greece. Private dinner parties were very common at home where Emily would, without a second thought, select a theme, specify the décor, and set the mood – harmoniously combining every detail and making simple dinner parties into memorable experiences. It was from these humble beginnings that Emily learned the value of quality, attention to detail, creating meaningful moments, and really making things awesome! After graduating from St. Catherine’s British Embassy School in Athens, Emily attended and achieved the Higher Level Certificate at The Institut Villa Pierrefeu Finishing School in Montreux Switzerland where she realized her future career. After Switzerland, it was off to England to study at the Institute of Event Planning, where she obtained a Diploma with Merit in Event Planning Management and qualified as a Certified Event Planner. We give our clients an undisputed level of personal service, navigating you through the entire planning process of your event in Greece, while curating all the complex layers of design and logistics. We have a carefully selected network of trusted affiliates that we choose to work with because they have proven to provide a level of service and quality that we want for each of our clients. Our refined sense of aesthetics, creative vision and impeccably high standards keeps us focused on every last detail for each of the events that we plan. We constantly strive to surpass expectation so that our events have meaning, make a statement, and leave a lasting impression and memory with you and your guests. 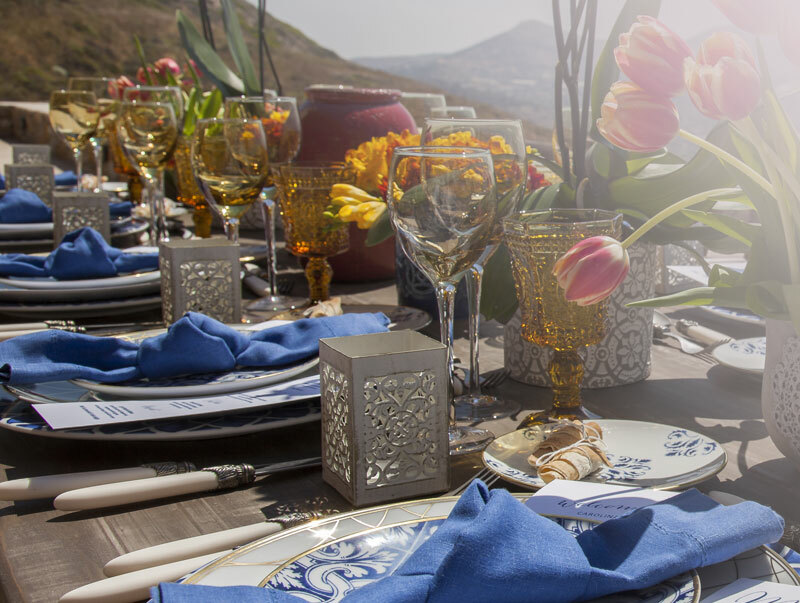 Whether you are planning a wedding in Greece, traditional baptism, special birthday party or spontaneous soiree, we believe that life is a celebration of experiences and nothing can be more meaningful than hosting events that spread cheer and joy to those you love. We only take a limited number of social events and weddings a year so that we can dedicate the time and attention needed for each of our clients. Although we are located in Athens, our expertise in event planning stretches across mainland Greece and the Greek islands. I’m easily inspired by the world around me, and I have a sharp eye for detail and quality. I’m a good listener and very observant. I’m constantly on-the-go, and ready for a challenge. I have a zest for life. I love the outdoors, nature, and road trips – this makes me very spontaneous and always up for a new adventure! Traveling, meeting new people and immersing into local cultures is what I enjoy most, but I especially love being a creative perfectionist and as a hopeless romantic, I’m always putting my heart into every special event that I plan. My favourite thing to do with free time: Anything that involves some kind of sport – hiking, swimming, rock climbing, snowboarding, cycling. One thing most people don’t know about me: Everyone gets addicted to my homemade baking! Life Quote: Life is short, break the rules, forgive quickly, kiss slowly, love truly, laugh uncontrollably, and never regret anything that made you smile.